Aurora, Colorado (CNN) -- Most businesses would hate to see their customers running out their doors, but in one suburban strip mall near Denver, Colorado, they are chasing the customers away -- with a chainsaw. "We're 'hauntrepreneurs,' we like to do things that are just a little bit different," says KathE Walker, who owns four haunted houses in the Denver area. "It's really exciting because you know you've done a good job," Walker says. "If they are running out screaming, then the actors have done their jobs, everybody has had a good time because they want to be scared. That's why they come. "If they're not scared, they won't come back." KathE Walker -- the capital E isn't a typo, "it's a '60s thing," she says -- laughs a lot for a woman in the business of scaring her customers. Walker, 59, runs her haunts with her husband and two grown sons. They spend the rest of the year making props for other haunted houses around the country and they throw a big science fiction convention each spring. Despite the tough economy, Walker says, business is good. 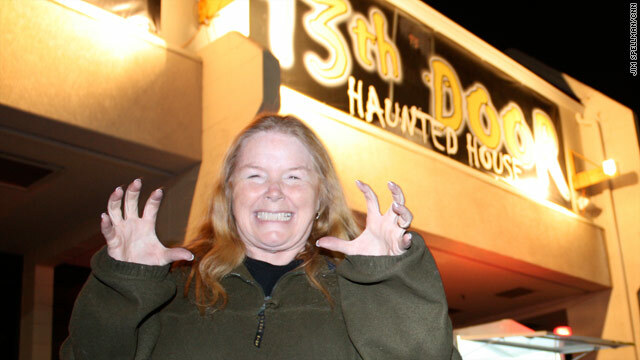 She anticipates a total of 40,000-50,000 visitors, each paying $14.95 to get scared. She employs about 175 people for the Halloween season. Three of her haunts are in unused storefronts in suburban strip malls and a fourth operates out of trailers in a field near a state park. Visitors are also asked to contribute a can of food for a local food bank. Larry Kirchner, president of the Haunted House Association, says business is booming across the country for seasonal frightfests. The association says there are 2,000 for-profit haunts across the country, plus another 1,000 houses run for charity. Around 20 million fright-seekers will pay an average of $15 a visit this Halloween season, according to the group. That's a surprising figure to some in these lean economic times. "We feel very fortunate," Walker says. "I know that the economy is very scary for a lot of people. The people that we aim the haunted houses at are kids in high school and college, kids that have a lot more disposable income. They're still living with their parents. "We don't draw a lot of people that are desperate to make their mortgages. ... It's great date-night stuff. Guys love bringing their girlfriends here, they're holding onto them. It's fun." It's fun for Walker, too. While giving a tour of Slaughterhouse Gulch, which features a series of movie monsters, she giggles as a cluster of date-night teenagers scream and run from Leatherface, the villain from the "Texas Chainsaw Massacre" films. "You make some money, obviously that's why you keep doing it," she says. "But for the most part we put a lot of money back into the haunted house so we can keep making them bigger and better. ... It can be kind of expensive. You cross your fingers each year hoping people will come." Walker says she loves the challenge of scaring people. "Some people come in and they say 'Oh you can't scare me,' " she says. "And they all end up running out of here, just terrified." "Clowns. I hate clowns. It took me a long time to finally let clowns be in the haunted house." Walker staffs her haunted houses with teens and 20-somethings who seem to have as much fun as the patrons. In the makeup room, Chris Parish is getting ready for his first day on the job. He'll be playing the guy chained in the bathtub from the movie "Saw." "Today is my first day scheduled, so I actually get to get paid for scaring people," he says. "Scaring people is really fun and it's something that I love to do." Halloween is makeup artist Michael Garvin's favorite time of year. He was laid off in July and hasn't been able to find another job, but during October he works days at a costume shop and nights making up the 35-40 actors who fill two of Walker's haunts. "When I was really young I fell in love with Halloween and then horror movies," he said. "I love this. I'd do this just for the fun of it, but the paycheck at the end of the month is a good thing." Caity Strother is 18 and has had trouble finding a job. It's her second year working in Slaughterhouse Gulch, where she specializes in portraying an undead ghoul. "I've filled out probably 50 applications in the last two months and gotten maybe four calls back," she said. Years of Catholic school have given Strother a skill that prospective employers have not been impressed by, but she puts it to good use in the haunted house. "I get to yell at people in Latin," she says.